Statement to Extraordinary meeting of the General Chiropractic Council: in response to the resolution by GCC Chairman Peter Dixon that Richard Lanigan should be removed from the members Council. It was passed by 13 of the 20 council members. The GCC is not fit for purpose. I reject The chairman’s resolution for my removal from council on his grounds that I disclosed confidential information to non council members and did not act in the best interests of the General Chiropractic Council. As far as I am concerned, this is yet another attempt to stifle legitimate debate within council. Nevertheless if one were to compare my offence with former council members efforts to open debate about councils due process it may seem catastrophic. Last year Peter called an extraordinary meeting because ( Former GCC Council Member) Kevin Proudman had only suggested to the chair of the CHRE that she should speak to some GCC lay members about concerns he had. Peter Dixon as chairman to the meeting and he was also proposing the resolution, and collecting the evidence and he was allowed to vote while I could not. I should have the right to have my hearing heard in public if I so wish. The normal procedure for making a complaint against a council member was not followed. The Chief executive Margaret Coats explained the need for secrecy in her letter of February 2007 “The minutes of Extraordinary meetings are withheld because disclosure would prejudice the free and frank exchange of views for the purpose of deliberation. If the minutes were disclosed the ability of the participants to be able to hold future discussions on similar matters and the minuting of such discussions would be seriously undermined” I believe the deliberations are kept secret because, last time solicitors pointed out all the faults in this process and by preventing legal representation for council members Peter has established what is no more than a “Kangaroo Court” making it more likely for Peter to get the decision he wanted. The concept of confidentiality within the GCC would seem to an oxymoron. There have been many investigations into leaks of information from council, in fact if we look at the latest investigation, so conditioned were the executive to assume breach of confidentiality, that solicitors were instructed before council members were even asked about the matter. So low is Peter Dixon’s confidence in the security of council information that in September 2007 he had to write to chiropractic council members (except me because I had posted openly) asking for assurances that they have not posted anti GCC sentiments on websites and if they had, to promise that they would not do so again in the future. The vote of confidence in former GCC chairman Michael Copeland Griffiths was confirmed to me by four council members before he actually resigned. I have had copies of the minutes for the majority of council’s closed meetings for the last five years sent to me. In March last year Peter accused me of dishonesty, because council members would not admit to having spoken to me about Maxine White (former GCC employee who resigned alleging bullying by the GCC Chief executive Margaret Coats), when in fact five members had spoken to me, and not one could provide details of the so called investigation which failed to contact Maxine herself. Peter has always been aware that I talk to chiropractors about regulatory matters and he has encouraged me to continue. On 27 September 2007 in response to that very point he wrote “You are right people need advice they can trust and these are the sort of things that I need to discuss with you. I am sure we can establish a mechanism for achieving communication without there being a problem from the GCC’s point of view and to talk it through will be very useful, I look forward to talking to you later.” We did and that’s why I did not volunteer for the IC or PCC. Would it have been better to divulge concerns about council covertly as others have done? In fact Tony Metcalf (President of the British Chiropractic association) showed so little interest in what I was telling him I suspect he knew already what had been said at the GCC closed meeting. In my opinion, Margaret and Peter are using data protection and confidentiality as tools to hide a dereliction of duty of management. An example of this is from March last year when Peter wanted a statement about ( former Deputy Registrar) Greg Price “being forced to resign for posting messages on anti chiropractic websites. But still getting a reference and landing a job at another regulatory body.” removed from the internet. However, Peter quoted confidentiality and data protection despite the fact it was common knowledge. There was no concern there for members of the public complaining to UKCP’s, another regulatory body which is also a registered charity, and like the GCC could be at risk from Price. d) that we had her over a barrel and she was gone until Christina started talking about her health problems. d) That I sent this email to council members. My solicitors have informed the GCC’s solicitors and Peter that the provenance of matters which form the grounds for my removal qualify for privilege because they were in the context of requiring discussion at council which Peter Dixon was actively preventing from taking place. Being a council member should involve dialogue and debate. The majority of council members leading up to the February meeting wanted the complaints that had been raised by (Former council member) Dana Green and (Registrant)Rod MacMillan discussed at the February meeting. One of those matters was related to the Chief executive opening Dana’s mail and reporting the contents to Peter. The Letter was from (Former Clerk to the Privy council) Graham Donald. In 2006 the chief executive made the decision to hire Mr Graham Donald in a temporary consultancy basis to support the regulatory function of the GCC. In July 2006 I raised concerns about his position and the possibility of a conflict of interest because he had been processing complaints from chiropractors at the Privy Council Margaret stated “As to ‘concerns’ that have been expressed to you, I am amazed that anyone would assume that a public servant of Mr Donald’s stature would ever breach confidentiality.” Dana Green is unsure whether Margaret’s email is before or after Mr Donald informed Margaret that Dana had been corosponding with the Privy council in relation to McTimoney college.. Regarding another complaint on 29th of January, Peter again wrote: “The relevant components of Mr MacMillan’s complaint will be dealt with in accordance with the councils complaints procedure. You will understand therefore that none of the matters raised by Mr MacMillan will be accepted as agenda items for the February meeting of council. “What Peter failed to mention, as with Dana’s complaint, is that he had received these papers months previously and done nothing until they contacted council members directly. Of course, lay members may not have received these letters because they were sent to the GCC office and like Dana’s post may have been opened and withheld subject to investigation. Peter refused all attempts to include these concerns in the agenda for the February meeting stating in his e-mail to me and council members on February 1 “The matters that you refer to in this e-mail are all being dealt with properly by me as the chairman. I hope that you are not trying to undermine my authority as Chairman, and I take exception to your impugning both my integrity and that of the Chief executive in this way”. In point 1.3 Peter is more specific regarding the actual statements he considered were a breach of confidence. Nevertheless, he still does not provide evidence that I revealed anything confidential about Margaret’s health. In fact, it was necessary for Peter himself to insert “Mrs Coats” into the statement to make it clear to council members who were not at the meeting that I was talking about Margaret rather than Christina. I have no knowledge of any health problems that Margaret Coats suffers from, it was stated at the meeting that she works too hard and is stressed. Only someone who was at the meeting would know what was being referred to in my e-mail. Stating that she might be the chief executive until she was 80 hardly suggests a conversation about Margaret’s apparent health problems. Turning to the second example Peter provided in the particulars. How can it be confidential when council members cannot recall Margaret saying what I alleged at the meeting. Peter did not accept the accuracy of my statement and alleges that it is libellous. He cannot therefore claim it to be confidential council information. Either it is true and confidential and council wants to cover it up or its untrue and libellous, it must be one or the other and therefore in the light of the statements made by the majority of council members I have to accept that my notes and recollection of the meeting must have been mistaken. Now turning to the third example in the particulars, I am not aware of any risk to council from Terry Rondberg ( an American chiropractor defamed on thre internet by GCC employees at work), nor is any council member that I have spoken to. I do not believe any reference to this has been discussed during my time on council. I was making a comparison between two people who I believe are bringing the chiropractic profession into disrepute and pose a risk. Isn’t the real risk to the GCC a class action by all the chiropractors whose complaints were administered by Greg Price? Has any advice been taken in relation to this risk and how to minimise it? Peter has not presented any evidence that the information that was in my e-mail was confidential or could have damaged council. If the e-mail has increased the risk to council were Margaret to argue constructive dismissal, it was Peter who sent the e-mail to Margaret which was sent exclusively to a privileged group with the interests of the chiropractic profession at heart, Margaret was not one of them. If I am guilty of anything it is no longer subscribing to the principle of collective responsibility of a council which seems to have decided that statutory self-regulation is the end which justifies looking the other way, when the means being used to regulate are not in line with the Nolan principles. We are criticised by the vast majority of the profession, former members of council and even the Chiropractic Patients Association. The CPA represent the very people we have a statutory duty to protect. In December 2006 they expressed the view that they had no confidence in the GCC, stating “if patients and chiropractors feel the same about the GCC, then the GCC has a problem not the patients nor the chiropractors.” As of 24 hours ago that view has not changed. I am accused of acting contrary to the best interests of Council. The GCC statutory duty is to balance protecting the public with the interests of the chiropractic profession. To achieve that goal is why I became a member of council. The evidence will show that it is Peter Dixon’s chairing of council that has brought the GCC into disrepute and undermined the profession’s confidence in council and that view is supported by the fact he polled the lowest number of votes in England and was fortunate to be re-elected. The fact that I have had to go to the extreme of drawing an extraordinary council meeting with a resolution to remove me from council to facilitate the airing of genuine concerns to council members, raises the question whether the GCC is “fit for purpose” and whether the chiropractic profession is able to regulate itself competently. The fact is that it is not able to operate as a homogenous profession on council and the divisions are always simmering away beneath the surface. As a result of these divisions the GCC gets away with paying only lip service to its principal stakeholders focusing instead on CHRE, managing to convince them of the great job they are doing, processing streams of vexatious cases. The chiropractic profession has the questionable honour of having the highest number of complaints ratio to registrants of any regulatory body. How ironic then on Friday that within an hour of council members receiving my e-mail describing how Peter was trying to prejudice this hearing in his favour, council members received an e-mail from Margaret stating “I’m sure you’ll be pleased to know that our CHRE performance review meeting today went really well, we met all the requirements and exceeded them in some cases.” The CHRE instructs regulators to cooperate with each other. One can only wonder what they will make of the fact that a former employee who the GCC had to report to the police is investigating complaints for another regulatory body because the GCC has kept it confidential. In 2002 I was an expert in one of the first cases to come before the PCC. It was obvious this was going to be a cash cow for experts and lawyers and would bleed the profession financially. Questions were being asked about Greg Price’s role in the regulatory process as early as this hearing. However it was not until 2006 that we became aware to the extent of his subterfuge and how he was acting against the interests of the chiropractic profession. Here is a person who has disparaged a large percentage of UK registered chiropractors and their places of education on anti-chiropractic websites while at the same time acting as executive officer to the body regulating the chiropractic profession. While Christian Farthings case was going on he was posting messages about him on the internet, this happened in number of other cases as well. On 7 February 2001 Greg Price contributed to drafting a statutory declaration from Mrs Coats setting out breaches of the code of practice by a chiropractor, before putting the declaration before the Investigating Committee for their consideration. Price then also sat as administrative officer to the Investigating Committee taking the minutes of the meeting. As Margaret was also the complainant in this case, Mr Price stepped into her shoes and managed the administrative functions of the registrar despite the fact that he himself had begun the complaint and contributed to the statutory declaration. In his testimony at the hearing Price saw no conflict of interest. According to the GCC’s own rules, Chiropractors are entitled to obtain impartial guidance on matters relating to conduct and practice from the registrar. Price refused an adjournment by letter dated 6 June 2001, saying that he had determined by himself that the hearing would not be postponed. The PCC, not being aware, of course, of Price’s subsequent extra curricular activities, rejected any suggestion of possible bias. In its disciplinary procedure the GCC has defined the role of the Chief Executive & Registrar and other managers as being “to establish and maintain standards of conduct and performance” yet despite a mountain of evidence against him the chairman and Chief executive are still denying the magnitude of Price’s wrong doing. It is as if the fact the police did not find enough evidence to warrant criminal proceedings made everything all right and there was no damage to council. Why did the police find no evidence? I stated that “I have been informed that police were told among other things that Greg Price solicited money from respondents to make complaints go away. Other council members have no knowledge of a police investigation involving GCC members of staff and in the light of current events I think council members should know if you were questioned by police about Greg Price and council business”. Margaret copied this to the Chairman, for him to respond. During the first break of the council meeting on 6th February, I showed Peter the police report by DS Mark Chard from September 2007, explaining their reasons for not pursuing a criminal action against Mr Price. DS Chard stated “The GCC themselves state that Mr Price role was not much more than admin. He was a support for Solicitors, employed by the GCC. It was solicitors who carried out the investigations. He was not involved in the decision making process”. I have sent DS Chard a copy of this correspondence and evidence showing that Mr Price was not merely admin and in situations where Margaret was acting as complainant Price assumed the duties of the registrar. After reading DS Chard’s statement Peter told me that he had no knowledge of any police investigation into Price and specifically said Margaret had not informed him of any investigation, later retracting that statement during the meeting, but not explaining why he had denied that an investigation had taken place and why he had failed to inform council members of the potential risk. All this should have been dealt with properly when the evidence of malfeasance surfaced after the GCC had spent £62,000 on solicitors Addleshaw Goddard to act on behalf of Margaret Coats and Greg Price in relation to defamation allegations, this investigation yielded one person posting and the only action available to the chief executive was to make Richard Southam visit her office. As a result of Addleshaw Goddard’s involvement, I found out that postings were being made on the chiropractic-uk website from the GCC server and reported it to Addelshaw Goddard. Document P shows that on 13th March 2006 notice was given to Greg Price of a disciplinary hearing for breaches in GCC IT policy and for making derogatory statements about me. Margaret also stated in that notice that “ It has also come to my attention that postings have been made on two other websites in the name ”Cognitio”.” (this information was presumably provided by Dana Green). Margaret goes on to say “I have not assumed this to be you” but would welcome comments at the hearing. Margaret provided Greg Price with copies of all Cognitio’s postings. She also enclosed notes of an interview made by a Brendan Russel with Greg Price in relation to the chiropractic-uk website. The letter finishes stating “that gross misconduct may result in dismissal without notice”. Rather than sacking price for gross misconduct he was allowed to submit his resignation admitting that his conduct made his position untenable and took up employment at another regulatory body. One assumes at this point GCC management thought the extent of Price’s posting activity had been contained. However there seemed to be one question unanswered. Who was the other cognitio, that Price was referring to, the only other website which he did not admit to posting on was the chiropractic-uk website and we know a cognitio posted 25 times on the site from a GCC server. Remember only one person can use a display name on a website and Margaret seems to be raising the possibility in the draft minutes that someone else using the pseudonym cognitio and may have done the postings on the chiropractic uk website from the GCC. I don’t think so, Cognitio resurfaced on Friday night on the chiropractic-uk site and it is Greg Price. On 5th May 2006 Council Members will have received a copy of a letter that I had sent to DOH and the Privy Council stating “a person using the pseudonym “Cognitio” has made many postings on a number of anti-chiropractic websites promoting the work of the GCC in the UK. I believe this person to be Greg Price until recently an executive officer of the GCC. 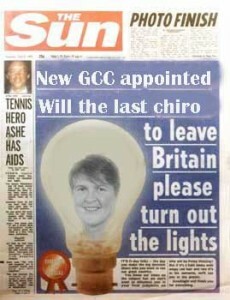 Price was recruited by Ms Margaret Coates and according to his testimony to the PCC in May 2002, he would surf the internet and refer chiropractic material he was concerned about to Ms Coates.” Ms Coats would later claim that Price never informed her of his rather innovative method of promoting the GCC internationally. In this letter to the DOH, I charge the GCC with a failure to regulate as required by the Chiropractic Act, in relation to a complaint I had made in 2002 regarding a chiropractor’s attempt to coerce £2,000 from a young woman with a stiff neck. I provided the patients details to the GCC nevertheless she was never contacted. Having then receiving a reminder of this old complaint with this letter, again failed to investigate, in fact it was only after being elected onto council that I was able to get Peter and Margaret to look into the complaint. On 19th December 2007 Peter wrote I have now conducted a thorough investigation into this matter, he quoted section 4.2 of the code of practice which requires “chiropractors to report to the registrar any concerns they may have about the conduct of another chiropractor, having first made an honest attempt to verify the facts upon which their concerns are based and to provide evidence as to what steps you had taken.” Apparently I had not done this. A GCC publication from 2007 “Working together” states The GCC must by law investigate all complaints about chiropractors; No ifs or buts there, they have to investigate period. In July 2005 Margaret wrote to Rod McMillan stating that the Investigating Committee asks its clerk to obtain information and that it is not within the discretion of Mr Price as the clerk to the IC to identify the information to be sought. Yet it was Mr Price who wrote on the top of my complaint not to be sent to the Investigating Committee because he, Mr Price, had concerns as to how I had acquired the information. He did not consult with the Registrar, he alone made the decision not to pass my complaint on to the Investigation committee. It was for the Investigating Committee to raise any concerns they may or may not have in relation to a complaint and instruct Price to get the information. Mr Price, as apparently he did quite often, preempted that process and made the decision himself without consulting anyone according to Ms Coats. In January 2006, I contacted the GCC with FOI request after a similar case had resulted in a suspension. Greg Price’s explanation was “you failed to respond to correspondence from the GCC and in particular to clarify whether information you had disclosed in respect to a patient had been disclosed lawfully. As a result, the Investigating Committee was unable to take matters further. In the letter I sent to the DOH and council members I clearly state that I did respond after returning from a trip to Cuba telling Price that the patient was happy to co-operate with a GCC investigation and make a statement and provided contact details for the patient. I asked Price again for an explanation of this decision under FOI and was informed IC deliberations are not available under Freedom of Information Act. However I now know the IC had never seen the complaint in the first instance. Then on 2nd August 2007 having completed her investigation, Margaret stated “You have not provided any evidence that Mr Price lied in a response to a FOI request from you”, which quite frankly stunned me when it is clearly stated in the response that the IC could not take the matter further. The fact is this is a clear example of the GCC failing in their statutory duty to protect the public to at the very least investigate the allegation against the chiropractor. Peter’s investigation was merely a parroting of Margaret’s findings concluding with the suggestion that If after five years you wish to pursue the original complaint then please do so by providing the information requested to the office within 28 days. Here you have a situation where they are both aware that the code of practice has been broken and that a member of the public needs protecting and they do nothing. Margaret stated on July 27th 2007 that she did not become the complainant in this case because “I do not recall that this matter was drawn to my attention in 2002 nor are their file notes to indicate whether it was”. In June 2007 in response to another FOIA request, Margaret stated that in the public interest the registrar should become the complainant. Regardless of the source of the informants wishes the GCC has a duty to act whenever it is in possession of information that suggests a registrant may be guilty of UPC. Meanwhile Peter is saying it is now down to me to make the complaint within 28 days. Perhaps Peter was not aware of this or that Margaret has acted as complainant at least 12 times. The fact is that they still have not tried to contact the patient and in my view this a gross dereliction of duty and due diligence that the public is entitled to expect from the GCC. If we consider the GCC’s good governance policy, the information I have provided, which is supported by documentary evidence, one would have to say that the GCC is itself lacking in many areas. 1.1 Governance simply means the processes, structures and organisational traditions that an organisation uses to direct and manage its general operations and programme activities. 1.2 Good governance means achieving desired results and achieving them in the best possible way consistent with identified relevant characteristics. This is what the GCC sends to CHRE however the reality would seem to be quiet different, In fact only two weeks ago a seemingly justified case at the PCC may be compromised because of Margrets lack of respect for the rights of respondents at a PCC hearing. 3.1 Good governance is the individual and collective responsibility of the members of Council, who have the duty and power to manage the affairs of the GCC. The key for the Council members in achieving good governance is the exercise of due diligence. 4.1 Council members are responsible for developing and carrying out the mission of the GCC, which includes determining the organisation’s vision and direction as well as ensuring the availability of resources. In carrying out their duties, the members must fulfil their duty to ensure that the GCC acts within its legislative framework. 5.1 The GCC should strive to achieve openness and transparency in all aspects of its activities. 5.2 The GCC is responsible for communicating to registrants, the public and other interested parties information about the policies, strategies and decisions of Council. 5.3 Effective communication from the GCC and the establishment of appropriate means for other views to be heard will ensure the ability of the Council to respond appropriately to issues that may arise and to evaluate the GCC’s mission and goals. Development and implementation of a Communications Strategy agreed with the Chiropractic Patients Association and Professional Associations. The GCC Rules address this and the Nolan Principles are embedded in the Code of Conduct for Members of Council. 7.1 In addition to understanding the GCC’s goals, structure and activities, the members of Council must also understand the role of the Council and their statutory duties as members of Council, as distinct from the executive role of the office. 7.2 The GCC should develop a broad governance policy and a Code of Conduct for Council members to give members guidance on how to proceed under various circumstances that might arise and ways in which the members may discharge their duties. 10.1 Members of Council should establish a framework of internal regulation, including a code of ethical conduct and policies on various areas of concern, to give members of Council and employees of the GCC guidance on how to handle issues that may arise. This would assist the members of Council to fulfil a number of their duties, such as the duty of act in the best interests of the GCC. I believe that by exposing misleading information to council by the Chief Executive and Chairman of the GCC I acted in the best interest of the General Chiropractic Council as our remit is to balance protecting the public with the interests of the chiropractic profession. Continuing to cover Mr Price’s activities and refusing to apologise for them has brought the GCC into disrepute. The comments I made about Margaret Coats were made on an occasion of qualified privilege because I have grave concerns about the damaging effect this matter has had on the chiropractic profession. Council members all agree that Margaret said there was no evidence of Greg Price using a GCC server to make postings on US websites this is simply not correct. Remember Christina Cunliffe statement to Peter, “I am certain Margaret said that there was no evidence that the posting on other websites were made from the GCC server, because I thought at the time that her words were deliberately precise Judith agreed stating “Margaret chose her words carefully and emphasised that there was no evidence that the postings on other websites were made from a GCC server”. Marisa stated “Margaret was very considered in her reply” . Kevin Grant’s comment is worth remembering “it is a small place to hide to say that there is no evidence”. I have provided some of these postings to Council members and some more from the Stop Rondberg site for ( GCC Council member) Steve Williams to pass on. Unfortunately, the final piece of the jigsaw is being held by GCC chairman Peter Dixon as to whether Mr Price was at work when these postings were being made. The fact Peter would withhold this information only brings his resolution into disrepute. Having accused me of libelling Margaret to state “the detail around Mr Prices employment is not relevant to the resolution that I have put to council”, is the height of cynicism from Peter and does nothing but bring members who support Peters resolution into disrepute. It is also worth analysing how this information was collected bearing in mind a common allegation made against the GCC is that witnesses against chiropractors subject to disciplinary proceedings are coached. This was the first time I had seen Peter’s investigatory process in action, and I was not disappointed. On 12th February Peter wrote to me stating “it is my recollection that Margaret specifically referred to the fact that there was no evidence that any postings on any websites, other than Chiropractic-uk.info, were made from the GCC server.” He then began his investigation into the allegations. Peter contacted Council members by email asking them “If you can recall accurately what was said on the specific point of the GGC server”. In case members were in any doubt, Peter provided them with his recollection of what Margaret had said. Structuring his question in this manner ensured Peter got everyone to agree with what Margret had said and by implication her statement to council was accurate. I was prevented from contributing to this discussion because Peter e-mailing the letter to council members and posted the letter to me. This ensured that I did not respond until after Peter had collected the statements. I did not disagree with Peter’s recollection only his conclusion, in fact he could just as well have included me in the statements of council members.Compare the process of information gathering to the objective approach of solicitor Peter Holt when he set about his task of interviewing Council members. First to respond to Peter was Linda She said “my recollection of what was said accords with your letter”. Second to respond was Christina and this time her recollections were sent to all council members, now if the process for gathering evidence was not tarnished before it certainly was now as council members played follow the leader. Alan Breen’s account “my recollection is the same as Christina’s”, David Byfield ”this represents my recollection of events.” What did not seem to occur to anyone is that this statement was also incorrect, there is evidence and Peter is hiding it. Peter now had the evidence he wanted to support action for my apparent libelling of Margaret, which was sent off to Field Fisher Waterhouse for them to take action. I do not dispute the fact that I contacted people who are not members of council. The first person I contacted was the president of the BCA and asked for his “opinion on what is in the professions best interest”. I informed Peter and a number of council members including Steve Williams that I was taking this action. I e-mailed Steve Williams and he has given his permission to read it out that “I am unlikely to survive this but if it gets rid of Margaret and gets the rest of you working together its got to be worth it. I have told Tony at BCA, Frank at UCA and Ross at SCA that Margaret has lied and refuses to apologise to the profession for Price. No point leaking things six months after the event its got to be now. At least you will be able to say I was not one of those chiropractors that bottled it. I hope we remain friends, actually everyone on council was nice and friendly, unfortunately they are afraid of change. Self regulation is not a carrot, if she comes with the package we will end up with her until she is 80”. I had talked to a few Council members after the meeting and their advice was to keep plugging away as others had done before with very little success. Later I e-mailed the president of the Scotish Chiropractic Association Ross McDonald and United Chiropractic president Frank McBride, both who were in my year at Anglo European College of Chiropractic and emailed, (Registrant) Ian Smith a mutual friend of Steve Williams and myself. Steve was not at the February meeting and I asked Iain if he would contact Steve regarding the way the issues were not being discussed at meetings. Steve and I had some good correspondence leading up to this meeting and had taken his advice to keep my head down at the meeting. On the morning of February council meeting I agreed with Peter to post a second apology to Margaret as outlined by Peter in Document D on condition the GCC apologized for derogatory postings about registered chiropractors made by Greg Price, Peter agreed to this. As you all know I was very reluctant to do this because I had done everything that council had requested of me in September with Peter and Carl’s blessing formy statement. Then at the November meeting Margaret was allowed to hijack the agenda of the closed meeting because according to Peter in his e-mail of November 29th she had threatened to resign if she did not get her way. For a second time I offered to resign nevertheless Steve and Alan wrote an apology for me which I read to Margaret and published on the internet. After assurance from Peter that this was the end of it within 24 hour the harassment began again wanting a more visible apology to appease Margaret. I was under no obligation to apologise to Margaret for statements I had made before becoming a member of council, however I apologized to reduce the supposed risk to Council for a claim of wrongful dismissal by Margaret. Peter had apparently been receiving advice from the law firm Croners for the last three months and he had been passing their advice on to me. Therfore it was quiet a surprise to have the risk to council explained to Council members by the lawyer who happened to be in the building investigating a breach of data protection who had not even seen Margaret’s contract of employment to evaluate any risk to council. Tony Medcalf did not phone me and I e-mailed him the following day asking his “ opinion on what is in the profession best interests” Tony reply (doc h) was I would suggest that you take this through the appropriate channels and not involve people outside of the Council to which you were elected. I told him I had done that and he told me There are ways of dealing with these issues and the members of the GCC were elected to do just that. If all the others on the GCC do not agree with you then I would begin to ask questions of myself. He went onto say that this does not mean that a director should not be prepared, if necessary, to express disagreement with colleagues, including the chairman or chief executive, but it does mean that he or she should accept that resignation or dismissal may sometimes be the ultimate consequence of sustained protest on a matter of conscience. I fully accept that view. For me that point came when the Chairman deliberately avoided full and open discussion as to whether the GCC should apologise to its principal stakeholder, the chiropractic profession, for comments made by a former employee that disparaged many registered chiropractors. 2.7 That I might possibly send information “to Rod”, Is the GCC now going to prosecute chiropractors for thinking about doing wrong in the future? 2.8 If at sometime in the future I choose to speak to a newspaper or put my postings back on the internet, my I remind everybody of the words of High Court Judge Mr Justice Collins in relation to London Mayor Ken Livingstone offending a journalist “ This is a free country and as such people have a right to free speech even if that speech is offensive to some people. How can the GCC say I have broken the rules when it is quit apparent management has shown a complete and utter disregard for their own rules and procedure. The fact is there is no independent mechanism for investigating complaints against officers of the GCC. I offered Peter the opportunity in (Document f )for me to resign quietly if he involved (council members) Graham Heale and Carl Lago in the investigation of all those complaints that have recently come his way. (Former council member) Richard Rumary highlighted the problem I have now when he resigned from the GCC in 2000, he wrote to me stating “the great problem was that, so long as I remained a member of council, I had no way of making known to the outside world, that I did not agree with many things which the GCC was doing. There is no mechanism for publishing dissent in the way of a minority opinion; you are stuck with the convention of collective responsibility – and if you are not prepared to accept that convention, then there is no alternative but for you to resign”. Otherwise GCC rules provide council members with the option to remove dissenters by voting them off the council. Dissenters who wish to remain on council have no option but to tow the majority line. I will not resign and will not tow the majority line while this abuse of due process is allowed to continue. The GCC are damaging the credibility of the profession for years to come and possibly the right to self statutory regulation. Peters solution is to present resolution to have one of the most neutral chiropractors on council removed. Whatever your decision there will be no winner today until council earns the respect of the profession and chiropractic patients. Just received the letter from the GCC. Thought you might be interest in it. I could email you a copy if you want. Once the GCC statutory Investigating Committee, acting on legal advice, has come to its independent decision to refer a complaint to the Professional Conduct Committee, the relevant GCC officer works with our solicitors to decide how to proceed with the presentation of the case. In respect of the case concerned with claims made on chiropractors’ websites the GCC, in its case presentation role, has given very careful consideration to the fact that throughout the period October 2003 to March 2010 the patient information leaflet published by the GCC contained reference to sciatica, asthma and infant colic. GCC officers have been advised that the reasonable course of action in respect of the case presentation is to accept that chiropractors were entitled to rely on information published by the regulator about these conditions. In light of that advice, the GCC in its case presentation role will not be proceeding in respect of any claim that chiropractic can treat sciatica, asthma or infant colic as listed in the particulars and/or any schedule to an allegation. There is no doubt recent events have concentrated the minds of chiropractors. The profession has a clear choice to make. To stay on this path and follow, Richard Brown, Christina Cunliffe et al or change direction. There were lots of good people out there to lead the profession, in this new direction, chiropractors like Richard Rummary, Tony Gilmore and the late Graham Heale. I am sure when chiropractors decide where their future lies, those leaders who refused to dirty themselves rolling in mud with pigs will be able to step forward untarnished and lead the profession. How could an independent grouping for chiropracTIC come to the fore? It all depends who is involved. I have always believed there should be one chiropractic association representing the interests of chiropractic and I believe given the choice the majority would go for a traditional chiropractic association. I could be wrong and traditional chiropractors become the minority, in which case they would be no worse than they are now. “So what might be the way forward? Do you think you could trust a mergered BCA/MCA not to continue the continued denigration of chiropractic? You have no idea how good it feels when I read something like that, that. Perhaps I have not completely wasted the last ten years. apparently someone agrees with you Richard and has nominated the GCC as overburdensome regulation and not fit for purpose.